Don the Women's Medieval Lady Lace Up Gown Adult Costume and be the fairest dame at the party. 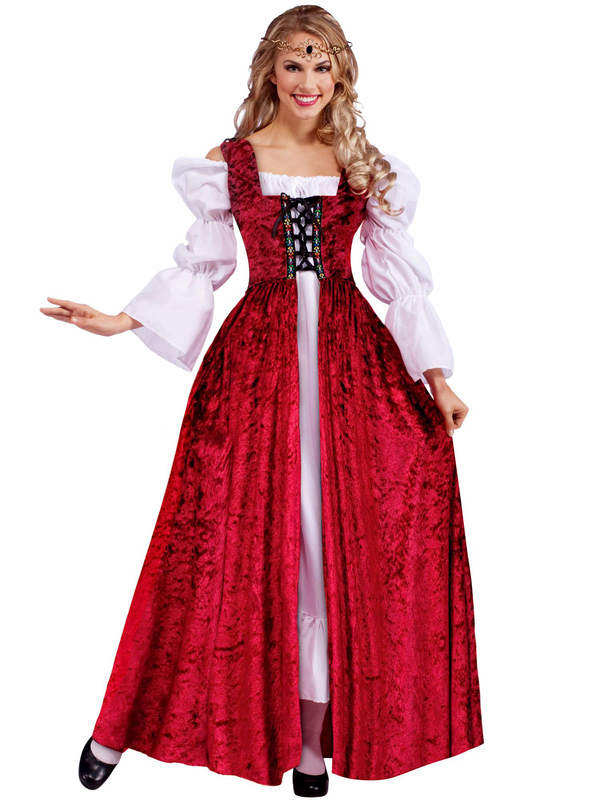 This costume includes a full length red crushed velvet gown with black crisscross lacing and multicolor designs on the chest, and matching red straps (the white underdress is not included). This outfit is based on the dyed clothing upper class women wore during Medieval times, and you can complete the look with items like white chemises, crowns, black shoes, blonde wigs and white petticoats, sold separately. The costume would fit in at any Renaissance themed birthday party, Renaissance fair or Halloween costume party, and you can go with friends dressed in any of our other Renaissance costumes, easily found elsewhere on our website. You'll impress all the lords and ladies and stand out from the wenches in this elegant Medieval ensemble.